One recent cold night, a longtime friend and I were looking for a Peruvian restaurant in Rockville, MD by the Town Center. After hunting high and low, we gave up and walked into the closest eating establishment in order to get out of the cold. We both had not savored Russian food before and the menu piqued our interest as we traversed down this gastronomic journey. Golden Samovar sits on the corner of Rockville Town Center. 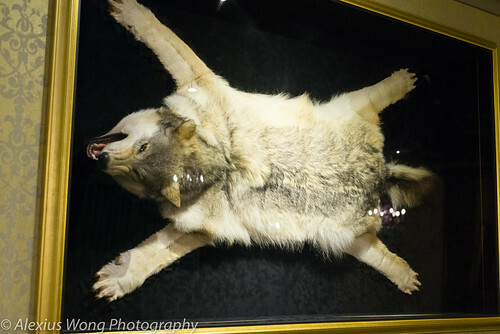 Walking in, you are immediately welcomed by a rather smart decor with a European touch in the chandeliers, embossed walled paper, and a framed Siberian wolf, which not only was it shocking but strikingly impressive. After navigating the terra incognito-like menu, we decided on a couple of appetizers that I had read or heard about. The first was Chicken Blintzes. 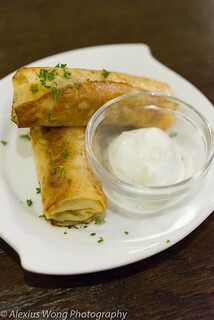 The rolls consisted of a buttery yet slightly firm pancake wrap filled with a shredded chicken filling, which we found tasting freshly-made and quite savory, especially with the house-made sour cream that was not overly tangy. The second was totally unfamiliar to us – Herring Furcoat Salad. What presented itself was quite perplexing since it didn’t look like a traditional salad but a cupbowl filled with reddish and creamy parts. But one spoonful was quite an eye-opener. It was a mixture of shredded fresh beets and carrots, chunks of briny pickled herring, sitting on mashed potato and liaisoned by a mayonnaise-like topping. The disparate elements spell out an unimaginable alliance, but this made an incredible combination that my friend and I couldn’t stop returning to. After the waiter told us that this dish was usually prepared for special occasions, I can see why due to its appealing flavors. My friend ordered Chicken Kiev which seems like standard fare. What arrived was a bit surprising. The ball of meat was finely minced chicken meat mixed with some breading and stock to loosen it up, and seasoned mildly. 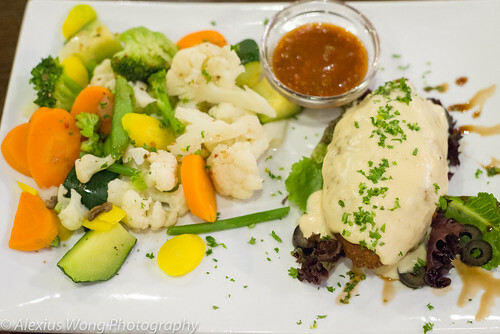 Instead of the usual stuffing with cheese, a creamy cheese sauce was napéd on the crispy breading exterior. This was a subtle dish that I was enjoying partly due to its novelty and “authentic” take of what we know this dish to be. 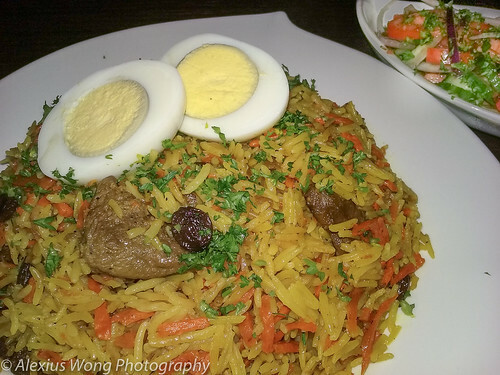 As for my main course, I ordered an Uzbek special, Lamb Plov, since the owner hails from the region. What arrived reminded me of Afghan Rice Pilaf, pointing towards the connections between the close countries. The fluffy basmati rice was well seasoned with stock and aromatic wood spices, sweetened by shredded carrots and raisins, and studded with fork-tender and well-seasoned pieces of lean lamb that tasted like a perfect partner with the rice. On another occasion, a couple of friends joined me for the $30 all-you-can-eat brunch menu, which was a rare treat for me. 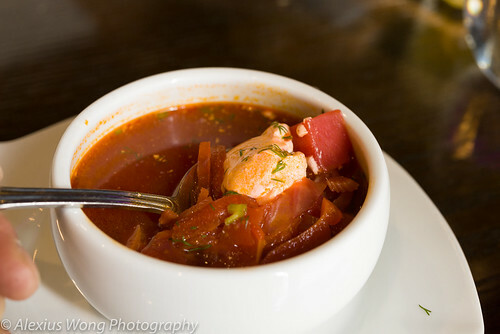 I started off the with Borscht soup which I though was a must-try. The soup had all the usual elements of beets, cabbage, pieces of beef, and sour cream, but it somehow was quite insipid for my taste buds that was yearning for more of a stock flavor. 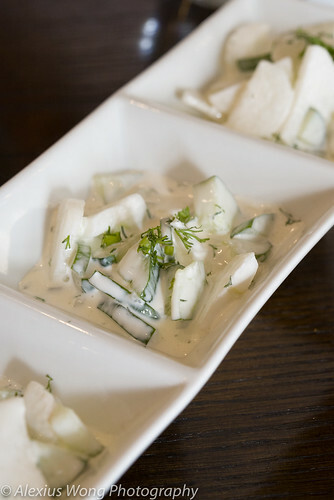 The side of Cucumber/Radish Salad was interesting being pieces of the vegetables coated with some sour cream and fresh dill, but it needed some salt and tang to lift its flavors up. 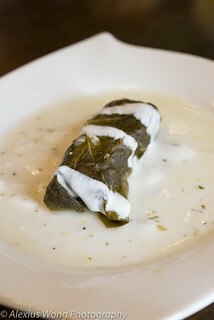 Since the owner is from the Uzbek region, stuffed grape leaf counts itself among the Russian dishes – Dolma. The small bite was attentively made with the right balance of flavors and acumen. Each bite consisted of a mild grape leaf wrapped around a light but spiced rice meat mixture, complemented by a tangy yogurt-like sauce – this bit of wonder called for a second order after its initial tasting. 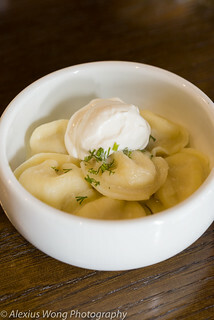 A recommendation for us was Pelmeni, reminding me of tortellini but here stuffed with a veal mixture. One bite into it was love-at-first-sight. The pasta was not too thick and a bit al dente, enveloping an amazingly light meat stuffing that was savory and irresistible. We couldn’t be satisfied with just our individual orders and we eventually had to get a second huge one. 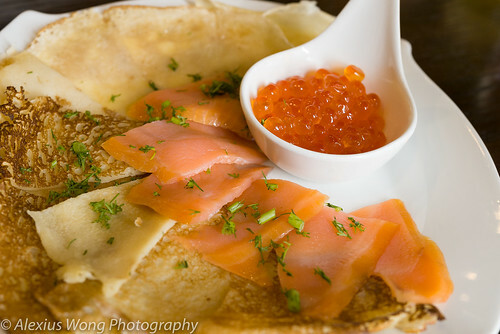 An order of smoked salmon, salmon roe and blintzes was next – Sakhalin Style Salad. The fish was of pretty good quality, the salmon roe briny and fishy, and the blintzes the perfect match with the strong seafood elements. We were thoroughly enjoying our big platter and we eventually added on another serving later. We were recommended to try the Russian Bratwurst. What arrived were sliced-up pieces that reminded me of good Viennese sausage but tasting home-made with its moist light texture. 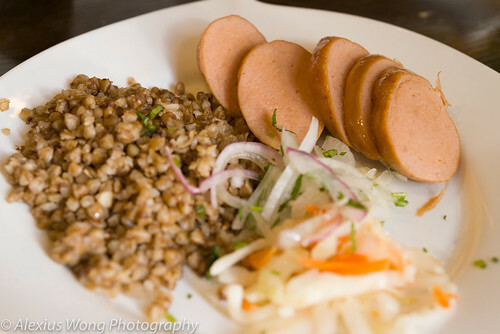 The side of spelt was tasty and well-made, as well as the cabbage salad that provided the necessary acid to balance the rich flavors and textures. These two dishes were quite a hit for some of us at the table. A couple of other small bites were among of plethora dishes that we ordered for brunch, albeit a la carte and thankfully made to order. 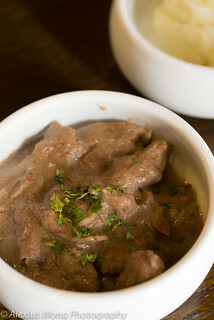 Beef Stroganoff seemed like a no-brainer for an order in a Russian eatery. The beef was lean and fork-tender, but I was surprised by how underwhelming this dish was, especially being a meat-chocked dish. I didn’t taste the mashed potato served alongside since I didn’t want to get stuffed with unnecessary dishes, but it looked properly made. 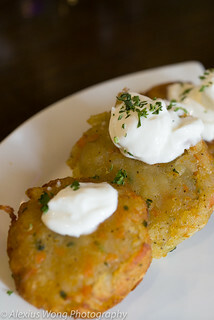 We were ingratiated with some Potato Latkes at the end, but we could only manage a couple of forkful which turned out to be quite light and well-made. 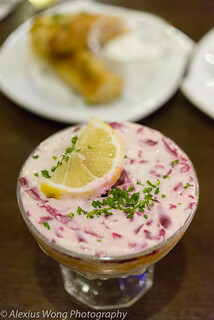 What we thought would be a crap shoot turned out to be quite a rewarding gastronomic journey in discovering what Russian cuisine is like at Golden Samovar. There were moments of revelation with the soul-stirring Herring “Salad” and Blintzes either stuffed with chicken or topped with smoked salmon. And there were some dishes that stood out due to their flavors and their skillful cooking, notably the Pilmeni dumplings that kept us hooked, the bratwurst dish, and the Uzbek offerings of stuffed grape leaves and lamb rice dish. As a foray into this European cuisine, this has been a discovery and a pleasing adventure into new-found gastronomic territory. 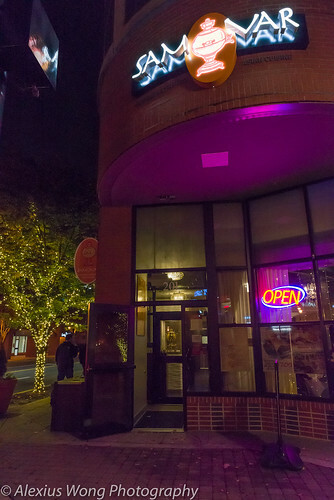 Judging from my visits so far, I think I will be heading back soon to Golden Samovar to discover more tasty delights of this wonderful East European cuisine.